Pultruded fiberglass grating is corrosion resistant, high impact resistant, skid resistant, and durable. The maintenance free design of pultruded fiberglass grating offers many advantages over conventional metals. This fiberglass grating is also lightweight and easy to fabricate, making it less expensive to install. In fact, the savings on labor and equipment often make the total installed cost of our pultruded fiberglass grating comparable to that of steel. Direct Metals supplies corrosion resistant pultruded fiberglass grating in your choice of IFR (isophthalic), VFR (vinyl ester) or phenolic resin systems. Our pultruded fiberglass grating is lightweight yet durable and is less than half the weight of steel grating. This allows for easy removal for access below floor level. Pultruded fiberglass grating also allows for installation with no heavy equipment and less manpower. Pultruded fiberglass grating has a durable grit surface that is permanently bonded and baked to the fiberglass grating surface. This creates a safe, slip resistant walkway. Our pultruded fiberglass grating is available with grit textures that are coarse or fine, for a comfortable feel to bare feet. 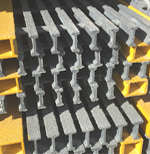 In addition to slip resistance, pultruded fiberglass grating provides fire retardant safety features. This fiberglass grating has a Class 1 flame spread rating of 25 or less, according to ASTM E-84. Pultruded fiberglass grating from Direct Metals is maintenance free, since this type of fiberglass grating is corrosion resistant, requires no scraping, sandblasting, or painting. The color on the pultruded fiberglass grating does not fade, it stays continuous throughout. This is also due to the UV inhibitors that are included in the pultruded fiberglass resin formulation, along with a surfacing veil and grit top surface for optimum protection from the effects of weathering. The pultruded fiberglass grating that Direct Metals supplies provides additional worker safety by reducing the risk of shock. This type of pultruded fiberglass grating is ideal for industrial applications since it does not affect electromagnetic or radio wave frequencies. There is no need for lifting equipment or expensive tools to fabricate pultruded fiberglass grating. This type of fiberglass grating can easily be carried by two workers and cut using standard circular or saber saws fitted with carbide blades.